"A rare and attractive Regency Staffordshire, best Ridgway porcelain, silver shape twin handled dish from a dessert service of very fine quality. 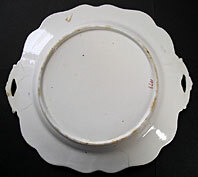 A superb example of early Ridgway porcelain. Decoration is exquisite - a wonderful painted study of a Flower Basket on a marble ledge against a sumptuous background of mazarine blue and fine gilded pattern. Quality of the flower painting suggests this may be the work of a former Swansea porcelain artist or perhaps one trained at nearby Derby. 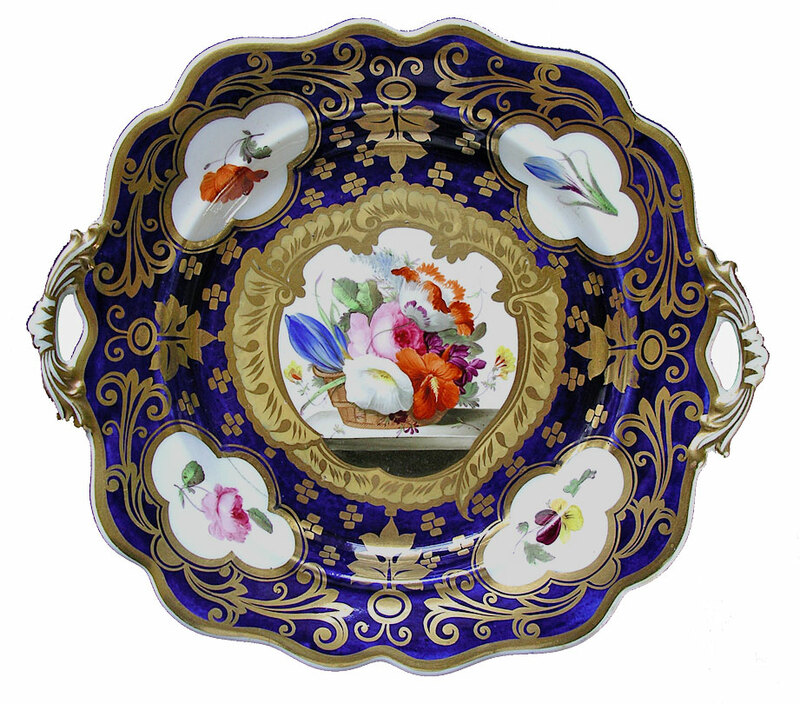 This fine cabinet-class dish must rank among the best work by both factory and artist... Stunning on display and worthy of the best English porcelain china cabinet collection." Antiques Expert Hamilton Bear. References: An example of Ridgway porcelain decorated with pattern 1079, on an ice pail, is illustrated by full page colour plate in the definitive guide to the subject - Staffordshire Porcelain, G. Godden Ed. plate IX. opposite page 242. Dimensions: width 238 mm max. Condition: In excellent display condition with no restoration. The centre decorated panel and painted flower sprays are excellent - fresh looking, with no significant wear. Original gilding, edge and pattern, is also excellent. There are a number of short hairlines clearly visible to the back. Two are visible to the front across one edge of the white of the small cartouches containing the single flower sprays at 2 o'clock and 7 o'clock; another is 'lost' in the mazarine blue background. These hairlines reflect the deficiencies in the original antique porcelain body exposed through use: fortunately do not threaten the stability of the piece which is sound or spoil the overall decorative qualities of a choice rare item.